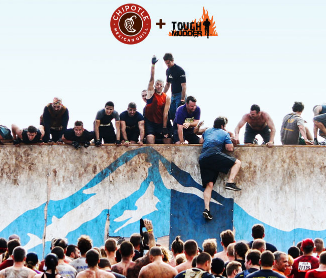 Chipotle “Tough Mudder” Sweepstakes – Win a trip to Australia & more! Win a trip to Australia & more! ENTRY LIMIT – There is a limit of one (1) entry per person for the Sweepstakes Period, regardless of method of entry. ELIGIBILITY – The Tough Mudder Sweepstakes is open only to legal residents of the contiguous United States (including the District of Columbia) and Canada (excluding Province of Quebec), who are at least twenty one (21) years old at the time of entry. SWEEPSTAKES PERIOD – The Sweepstakes begins on April 6, 2015 at 12:00:01 a.m. Eastern Daylight Time (“EDT”) and ends on April 26, 2015 at 11:59:59 p.m. EDT. PRIZES – One (1) GRAND PRIZE: Grand Prize will consist of a trip for the Grand Prize Winner and one (1) guest to Australia for the opportunity to participate in or watch a Tough Mudder obstacle course competition. The Grand Prize Winner will have their choice of attending one (1) of the following three Tough Mudder competitions: 1) Tough Mudder in Sydney: November 21 – 22; 2) Tough Mudder in Melbourne: October 17 – 18; 3) Tough Mudder in South East Queensland: September 12 – 13. Prize includes round-trip coach air transportation from major gateway airport closest to Winner’s residence; seven-day, six nights of first class hotel accommodations (1 room, double occupancy); first class ground transportation to and from airport nearest winner’s home, and between airport and hotel in Australia, $2,500 spending money to be awarded in the form of a check in the currency of winner’s home country and two tickets to enter the Tough Mudder competition. Approximate Retail Value (“ARV”) of Grand Prize package: $10,000 (either USD or CAD, accordingly). Two (2) FIRST PRIZES: Each of two (2) First Prizes will consist of fifty-two (52) Free Burrito Cards (up to a value of $10 each card) to be redeemed by each First Prize Winner at any participating Chipotle Mexican Grill Restaurant. ARV of each First Prize: $520 USD or CAD.